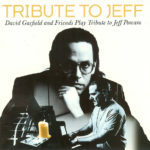 David Garfield (September 27, 1956 in Chicago, Illinois) is an American keyboardist, songwriter, and producer. David Garfield performs in the Los Angeles music scene. He has recorded with Smokey Robinson, Cher, Larry Carlton, Steve Lukather, Spinal Tap, George Benson, The Manhattan Transfer, Eros Ramazzotti, and The Rippingtons. He has performed with Freddie Hubbard, Boz Scaggs, Oleta Adams, Brenda Russell, Natalie Cole, and Michael Bolton. Garfield is a founding member of “Karizma” and “Los Lobotomys”. David’s production and arrangement of “Let’s Stay Together” featuring Michael McDonald, Don Henley, Richard Marx, Bill Champlain and David Pack from his CD “Tribute to Jeff” made the top ten radio worldwide. All songs recorded in LA, Nashville & New York City between 4/30 and 8/26, 1996. This is the 600th album on my site. I reached another milestone today!!!!!! Congratulations Jan! Thank you for your many hours of finding and sharing these archived treasures of these amazingly talented human beings of whom, I am certain, several are musical geniuses. Such great use of time to enlighten and entertain us all! You are very kind and generous. ✌? ?